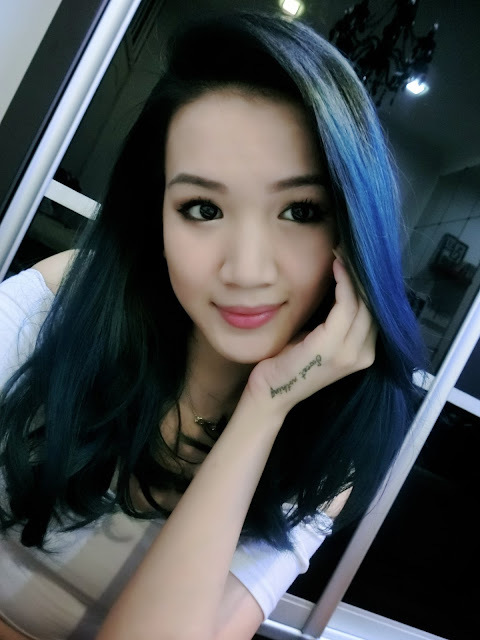 Living in a hot humid country like Malaysia, my skin is prone to breakouts and oily skin. One thing I always had to deal with is my makeup smudging and looking all so shiny by the end of the day. 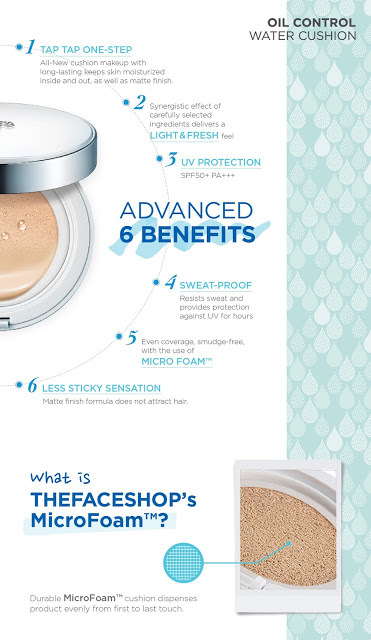 I was stoked when THEFACESHOP announced their new product that is perfect for this weather as it delivers an all day perfect make up look with it's Oil Control Water Cushion foundation! It's a next generation solution for people who face problems like me or who would love to have flawless skin the whole day! I've tried it and it is very moisturizing, plus there's no icky sticky sensation after applying due to the Microfoam™ cushion dispenser that helps application with ease from the first to the last touch! It provides a natural coverage while still being able to cover the redness of my face. Not only that, I managed to try out some of their other products too and that's how I achieved my look above. All thanks to THEFACESHOP! From the Oil Control Water Cushion, eyeshadow, cream blusher, lip stain, mascara and eyeliner but of course the star of it all goes to the Oil Control Water Cushion! A very simple and beautiful packaging, very easy to carry around in my clutch or handbag perfect for me who is always on the go. I can easily touch up if I needed to or especially when I travel. 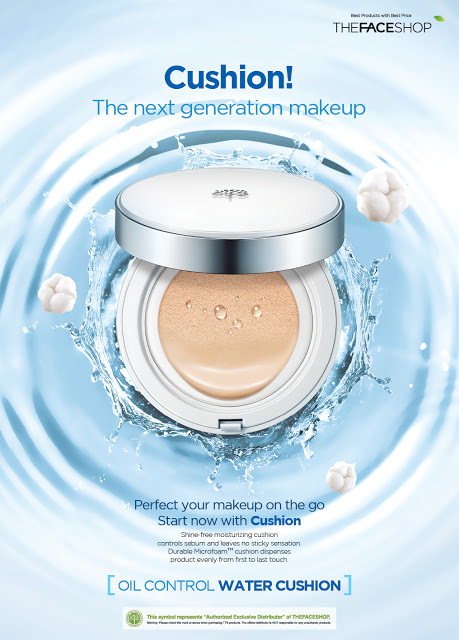 The Oil Control Water Cushion has a very cooling hydrating feeling when applied which I love! It's all in one. It contains SPF 50+ PA++, it's a make up base and also foundation! Natural finish with it's light natural coverage. It's matte on the outside and hydrates on the inside especially with its cooling effect. Cools down heated skin when applied as its moist contents from the sponge saturates the liquid foundation. No restriction on reapplying. Allows us to enjoy the full sun protection effect without getting our hands dirty. MFDS certified sun protection formula to protect our skin from UV rays. Contains Microfoam™ which prevents the shifting and caking of Urethane cushion. For even, meticulous cover without having to apply powder. After applying the Oil Control Water Cushion I continued with my usual makeup steps but using all of THEFACESHOP's products. For my cheeks I used the Soft Cream Blusher. Very easy to apply, warmed the product with my fingers and spread it evenly on my cheeks for that lovely glow. Then for my eyes, I used the duo eyeshadow palate in neutral shades of brown. If you know me, I love doing the cut crease technique where I'll apply the darker shade on my crease to highlight my double eyelids. I then continued with a normal wing liner using the Ink Graffi liner and finishing it off with the Volumnizing Mascara. Then on to my lips! I love lip stains nowadays as it gives my lips the pucker upper it needs and it looks very natural! 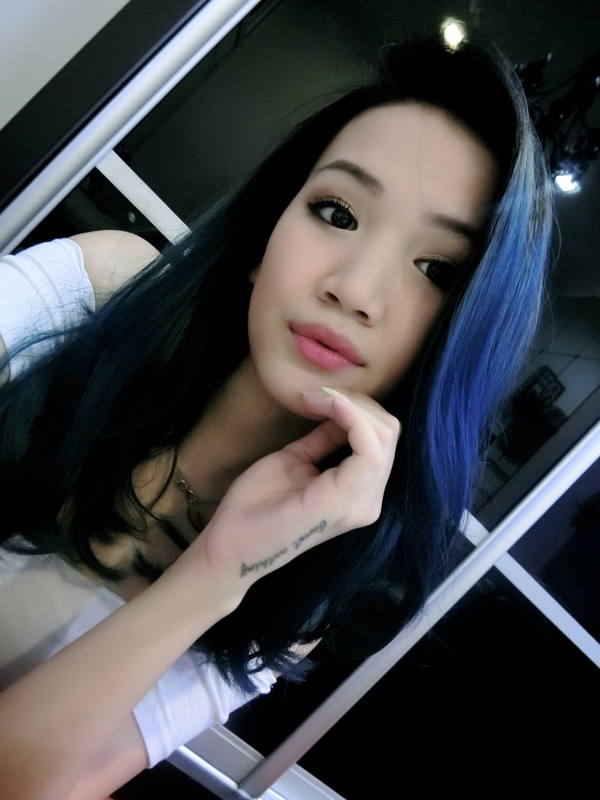 My solution to flawless makeup? the Oil Control Water Cushion! A whole new innovative type of makeup product that contains whole liquid foundation in a hard foundation case by using Microfoam™. Now I can have perfect makeup look from morning to the end! It has sebum control, provides a fresh coverage, clear moisture radiance and prevents makeup from sliding off! Use as a step of foundation. Put suitable amount to puff and apply on to the skin. Push middle part of the case with two fingers. Take apart that comes up from the case, and replace the refill. Easy as that! The FACESHOP currently operates at 49 outlets in Malaysia! * Sign up now on the microsite and receive a promo code where you can download a discount code from that microsite and at the same time can get free membership upon filling up the details!